Ravens vs Patriots: Which team would Poe root for? For more than 150 years, the city of Baltimore has embraced the legacy (as well as the body) of Edgar Allan Poe. The house where he lived with his young wife Virginia and her mother Maria Clemm has long been a museum. 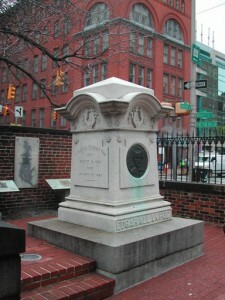 And a stately monument – erected with pennies donated by the school children of Baltimore – marks the much visited tomb where the trio is buried. In the 1990’s, when the late Art Modell moved his football franchise from Cleveland to Baltimore, the near universal sentiment was to rename the team after Poe’s caustic character, The Raven. Dressed in purple and black, the team has soared to stratospheric heights while cementing the city’s unmistakable bond with the immortal writer. But what about Boston? Most football fans can tell you that this Saturday, Joe Flacco and the Ravens will travel to New England to take on Tom Brady and the Patriots. No doubt, the Ravens will be joined by their mascot, Poe. But there are several Boston connections to Poe of which the casual fan may be unaware. First, Poe was born in Boston on January 19, 1809. At two, he was orphaned, and taken in by the Allan family of Richmond, Virginia. Yet Poe’s spiritual tie to Boston remained. 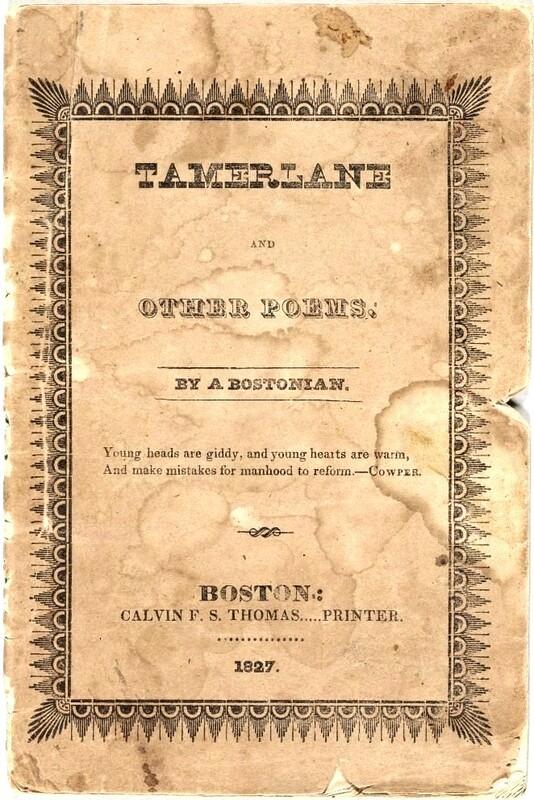 His first collection of verse, Tamerlane and Other Poems (1827) was published anonymously during a short sojourn in Beantown, with the simple byline: A Bostonian. 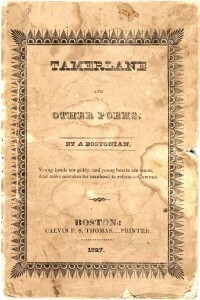 Poe would also return, in a sense, when The Tell Tale Heart was published in Boston in 1843; and again with his last published poems in 1849. There is even a suggestion that Poe was ultimately headed to Boston when he met his untimely death in Baltimore. The connections are undeniable, and that raises the question: Were he alive today to see the game this Saturday, for which team would Poe root? Of course, there is no way to know which team (if any) the master of the macabre would back. It would take the intuitive skills of C. Auguste Dupin to even begin to address such a question. Still, the Baltimore Post-Examiner wondered if there may be a clue to discern Poe’s possible sympathies; either from his life and his writings, or from something about the two teams destined to meet in New England. To find that answer, we put several questions to two well known Poe afficionados: Katherine Kim of Boston and Jeff Jerome of Baltimore. Dr. Katherine J. Kim teaches writing and literature at Boston College and Emerson College. Kim created and co-organized a celebration at Boston College for Edgar Allan Poe’s 200th birthday that sparked a revival of recognition of Poe in Boston, including the installation of a statue of Poe near the Boston Common. Jeff Jerome is the Curator Emeritus of the Edgar Allan Poe House and Museum. During his career, Jerome debated several critics about Poe’s intrinsic ties to Baltimore. He also hosted numerous Poe-centric events at the museum and at Westminster Hall and Burying Grounds. It should be noted that both scholars enjoy watching an occasional game, though Kim admitted she prefers baseball. Neither one owns a Tom Brady jersey. BP-E ~ Is there any record that Poe was a sports fan and if so, did he bet on games? JJ ~ Keep in mind that in Poe’s day, sports as we know them now did not exist. In college, he boxed, swam, he even broad-jumped 26′ 8″. But after college there was a change with him physically and that may have led to more sedentary pursuits – hence his writing. BP-E ~ So, does Baltimore have any edge because we named our team the Ravens? Poe’s body is here in Baltimore. Score one for The Ravens. KK ~ Poe seemed to enjoy writing with sarcasm and irony. I think he might actually get some glee out of the Ravens losing this time. JJ ~ Psychologically, we have a lot to back us up. Poe’s grandfather served in both the Revolutionary War and the War of 1812. His grandmother made trousers for the French troops passing through Baltimore during the Revolution. And we have Berenice, his short horror story which we have performed here at the dental school. (Laughing) Who isn’t afraid of the dentist? 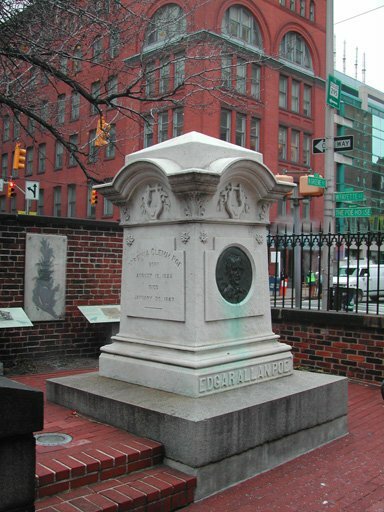 BP-E ~ Without being morbid, does it help Baltimore that Poe died and was buried here? KK ~ Boston gave Poe life while Baltimore took it away. If anything, Poe should return from the grave (like a number of his characters do) and seek revenge! BP-E ~ Then why, were he alive, should Poe root for Baltimore, if we in effect killed him? KK ~ He shouldn’t (unless he wants to root for his own death and initial burial in an unmarked grave)! Plus, his mother told him to love Boston, and you should always do what your mother says! BP-E ~ That’s good advice, but does it help the Pats that Poe was born in Boston? KK ~ Yes! Poe was born here, served in the military here, published his first book here, and supposedly wanted to die here (he allegedly attempted suicide in a Boston hotel in 1848). He couldn’t help it that he died under mysterious circumstances in Baltimore. BP-E ~ Just the same, would Poe root for Boston, when they ignored him for so long? 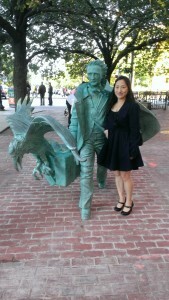 Katherine Kim with Poe in Boston. BP-E ~ Will the Patriots benefit by being coached by someone as diabolical as Montresor? KK ~ Possibly, but you can never underestimate the cunningness of ravens, and perhaps that trait has been acquired by Baltimore’s team. JJ ~ It’s hard to say. Maybe Fortunato had it coming. BP-E ~ Can we draw any analogies about this game from The Tell Tale Heart? KK ~ The Ravens better be wary of the loud thumping sound that is the Patriots’ march to face Baltimore! BP-E ~ What about The Cask of Amontillado? JJ ~ There is no wall the Ravens can entomb the Patriots behind, but I think there are tell tale signs we’re gonna bury them. BP-E ~ Is there anything else you’d like to add? JJ ~ There is one more thing. If you look at our statue of Poe, he is seated in a chair like he is here to stay. The statue in Boston looks like he is running out of the city as fast as he can. The Baltimore Ravens face the New England Patriots this Saturday at Gillette Stadium in Foxborough, Massachusetts. Game time is 4:35pm. Fans can catch the game on NBC television; or on the radio at WBAL-AM – 1090 in Baltimore; or WBZ-FM – 98.5 in Boston. Jeff Jerome, in association with the Westminster Preservation Trust, will host Behind the Mustache: The Lives of Vincent Price and Edgar Allan Poe. This once in a lifetime event marking Poe’s 205th birthday, will feature appearances by John Astin – best known as Gomez Addams on The Addams Family, and Victoria Price, the daughter of the late film, television and stage star Vincent Price. Festivities are set for Sunday January 18 from 4-6:30pm at Westminster Hall & Burying Ground 519 W. Fayette Street, Baltimore, Maryland. Tickets and other information may be found by visiting University of Maryland Law or on Facebook. 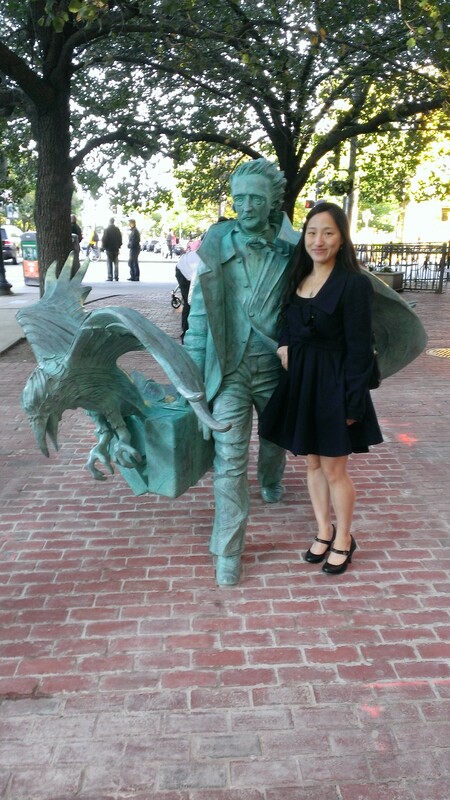 Dr. Katherine J. Kim is a founding member of the Poe Foundation of Boston and a contributing writer to Dr. Kevin Hayes’ Edgar Allan Poe in Context. A thorough account of her involvement in spearheading Boston’s 2009 Poe Bi-Centennial celebration may be found at poeforevermore.com. Really great and interesting article. Go Ravens!